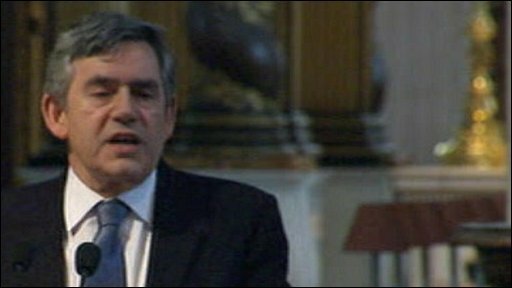 Gordon Brown has called for banks and financial markets to adopt "family values" as world leaders gather in London for Thursday's G20 summit. In a speech to religious leaders the UK prime minister said: "In our families we raise our children to work hard, to do their best, do their bit. "We don't reward them for taking risks that... put them or others in danger." US President Barack Obama arrives later for what has been billed as a potential turning point in tackling recession. Mr Brown has stressed that the main aim of the summit, in London's Docklands, must be to "clean up" the global banking system, but doubts have been raised about what the leaders will agree on. The Times says French President Nicolas Sarkozy has threatened to walk out if he fails in his demands for a worldwide financial regulator - an idea opposed by Britain and the US. Instead, countries are expected to agree greater cooperation among national regulators. However, ahead of the summit there has been progress on tougher regulation of tax havens and Mr Brown is holding a series of talks with world leaders arriving for the summit as efforts continue to agree concerted action. In an address to religious leaders gathered at St Paul's Cathedral about the aims of the G20, Mr Brown said that "markets need morals". During his passage about families' values he said people did not encourage their children "to seek short-term gratification at the expense of long-term success". "And our task today is to bring financial markets into proper alignment with the values held by families and business people across the country." Business Secretary Lord Mandelson said there were "very positive signs" the summit would agree a way forward on key issues. There was also a positive outlook for the summit given by President Obama in an interview with the Financial Times: "With respect to the stimulus, there is going to be an accord that G20 countries will do what is necessary to promote trade and growth. "The most important task for us all is to deliver a strong message of unity in the face of crisis." Shadow chancellor George Osborne, for the Conservatives, said the UK government's entire economic strategy had fallen apart when Bank of England Governor Mervyn King said that "this country could not afford to borrow more for a second fiscal stimulus". But he said there was "common ground" on the G20 and welcomed the summit being held in London. On financial regulation, he told MPs the test would be whether the G20 "engages with the difficult issues or ducks them". But he said the UK government would have "more credibility" on bankers' bonuses and offshore tax havens if the prime minister had sacked Lord Myners, the City minister accused of signing off RBS bank boss Sir Fred Goodwin's £703,000 pension. 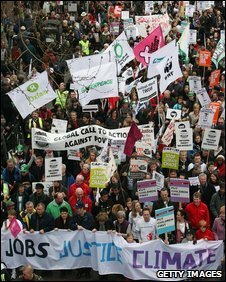 The G20 has prompted one of the biggest security operations ever mounted in the UK, with mass protests planned by anti-capitalist groups and the Stop the War Coalition among others. Mr Brown said no violence or intimidation would be tolerated from protesters and that police would act "very quickly" to protect people or property under threat. Mark Barrett, from the anarchist protest group G20 Meltdown, told the BBC its demonstrations, in the City of London on Wednesday and outside the summit on Thursday, would be peaceful. World leaders will meet later this week in London to discuss measures to tackle the downturn. See our in-depth guide to the G20 summit. He said: "Tomorrow there will be a lovely party. That's what we've organised. "We are going there with the intention of having a great party, so lets make it that." 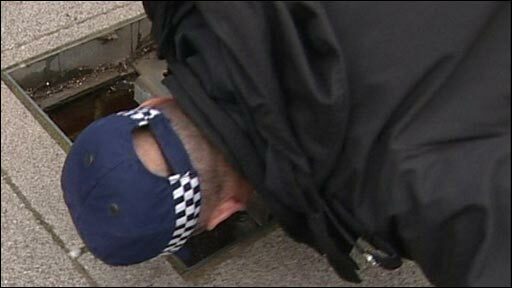 Scotland Yard is describing the G20 policing plan as one of the largest and most complicated public order operations it has ever devised. Some 84,000 police man hours have been allocated to the entirety of Operation Glencoe, the G20 security strategy. All police leave has been cancelled in London for Wednesday and Thursday. A number of Lib Dem MPs will attend a protest march in central London on Wednesday, the party has said, to observe how the high-profile demonstration is policed. David Howarth, the party's justice spokesman, said people's right to protest peacefully should be respected and there was no excuse for "heavy-handed or disproportionate" policing. Six police forces are part of the £7.5m security plan. The Metropolitan Police is leading, but calling in colleagues from the City of London and British Transport Police. Outside of the M25 motorway, officers from Bedfordshire, Essex and Sussex will have roles in securing the arrival and transfer of delegations to their embassies and hotels. Inside the capital, police will co-ordinate the movement of these entourages and create a sterile environment at the ExCel centre, base for the talks in east London's Canning Town.